I had the great pleasure of trying out some brand new yarn from Premier. It’s called Sweet Roll and I overall I really enjoyed it! Premier sent me two cakes to try out. One in Capuccino Pop and one in Cherry Swirl. The Squid immediately asked me to make her “a scarf that wraps around” in the Cherry Swirl. I thought a cowl scarf would be the perfect little project to try the yarn out. I thought it turned out a little big for her but she loves it. You can scroll down for the free pattern or you can head to the Ravelry pattern page HERE to purchase the PDF for $1. Sweet Roll is 100% acrylic which makes it perfect for those gifts or for people with possible wool allergies. When I first started working with it I will say I was a little worried because the first color change I came to had a knot. However, that was the only knot I found and it was actually at the perfect spot which makes me think there’s good quality control. The yarn is nice a plump, round yarn. It was a little stiff when I first worked it up but after a quick wash and dry it got really soft and loosened up beautifully. As far as softness I think it’s pretty soft. The Squid is really sensitive to scratchy yarns and she’s been just fine with it around her neck. You can purchase Sweet Roll through Premier’s website now (using the button below). Use the coupon code KATY10 to save 10% through October 31, 2016. It should be on the shelves of A.C. More on the East coast this weekend and at Jo-Ann stores in late October. One size. This cowl can be made any size. 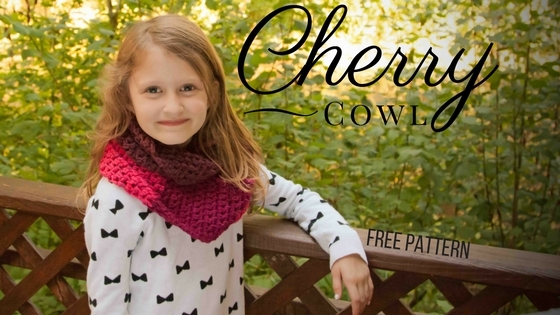 This cowl can be made in any size. Start with an odd number of chains. Extended single crochet (esc): Insert hook into the stitch indicated, pull up a loop, (yarn over, pull through one loop) 2 times, yarn over, pull through 2 remaining loops. Repeat row 2 to desired length (for the sample I used the entire cake). Weave in all ends if you'd like a scarf. To make a cowl slip st the last row to the beginning row of chains.